COCKPIT LAYOUT Both pilot's have an identical set of primary flight instruments. 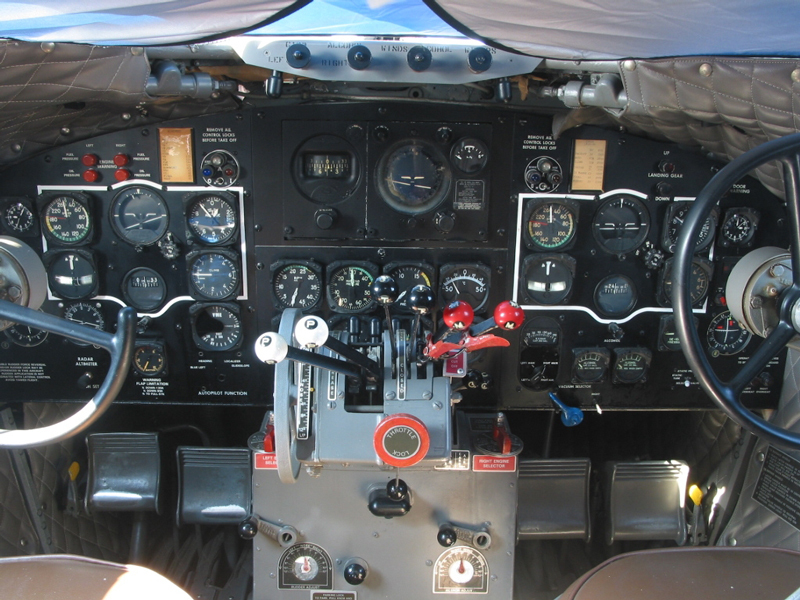 Engine gauges are clustered in the center beneath the Autopilot. The Control Quadrant is mounted atop the Control Pedestal. 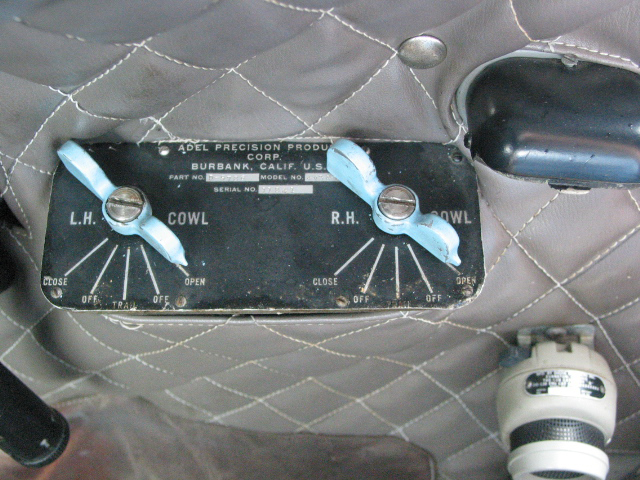 Above the autopilot are the four valve knobs that control the wipers and the alcohol de-icing system. Instrument Panels will be covered in a separate page. CONTROL QUADRANT The DC-3 has a non-standard lever arrangement in that the Throttles, normally on the left, are in the center. 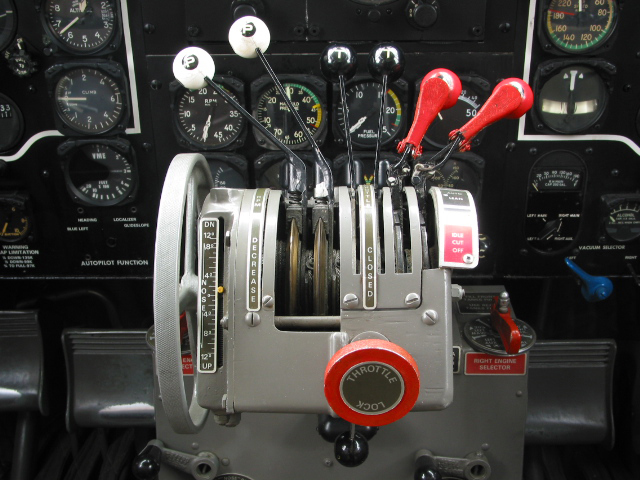 The Prop Pitch (RPM) levers are on the left and the Mixture levers are on the right. 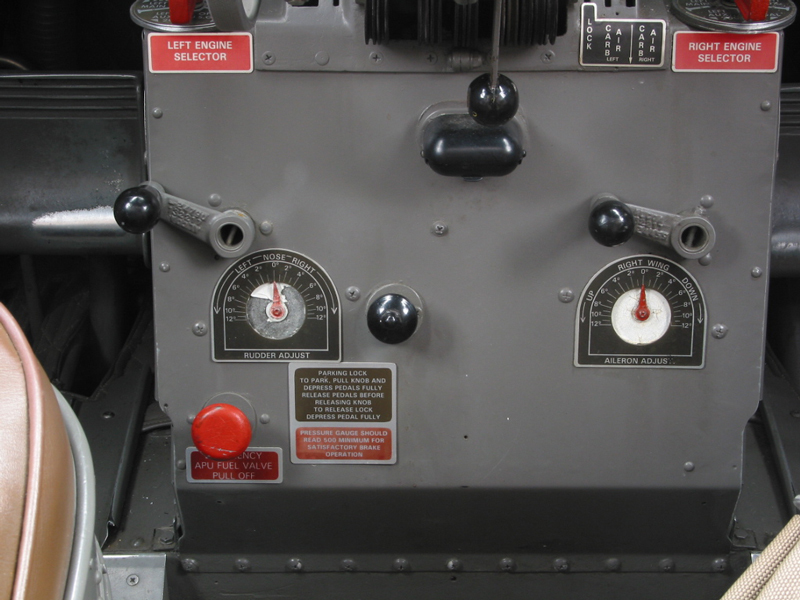 The Pitch Trim wheel and it's scale with the yellow dot pointer are on the left. Nearly hidden in this photo, on the right are the Carburetor Heat Levers. LOWER CONTROL PEDESTAL The black knob at the top center is the Tail Wheel Lock. Beneath that is a light to illuminate the trim indicators. Everything else is identified by labels. 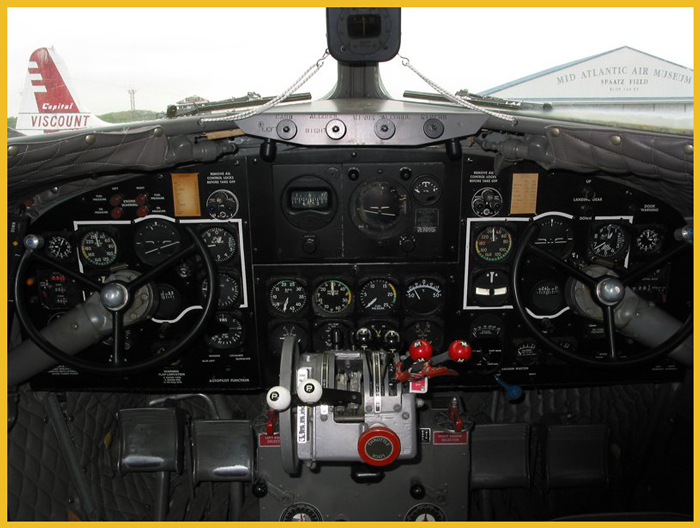 The Rudder and Aileron Trim is adjusted with the cranks and the degree of trim is read from the dials. FUEL TANK SELECTORS Mounted on the corners of the lower control pedestal are the right and left engine Fuel Tank Selectors. The numbers on the segments are the capacities of each tank in gallons. 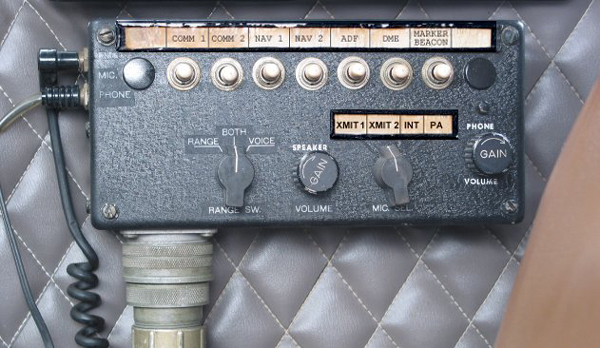 Here you can also see the Carburetor Heat Control Knobs. LANDING GEAR AND WING FLAP CONTROLS We are looking down at the floor in this shot. 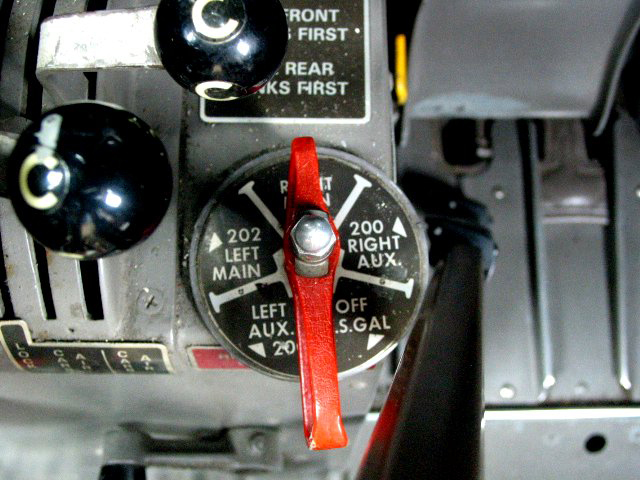 The lever between next to the pilot's seat id the Landing Gear Positive Lock. Mounted on the bulkhead behind the copilot are the actuating levers for the Landing Gear (lower handle with black handle) and Wing Flaps. The Fire Extinguisher and Fuel, Oil, and Hydraulic Shutoffs are inside the red housing. 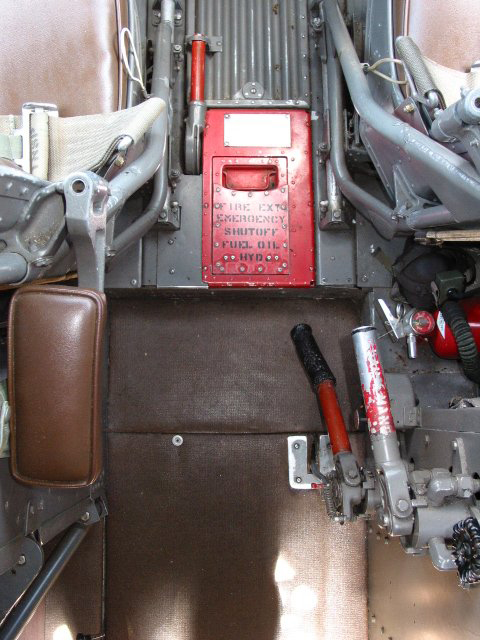 COWL FLAP CONTROLS These levers, mounted on the copilot's side wall, open and close the Cowl Flaps hydraulically. These control engine temperature by regulating the amount of air that passes over the cylinder heads. RADIO CONTROL BOX There is a control box on each side wall. 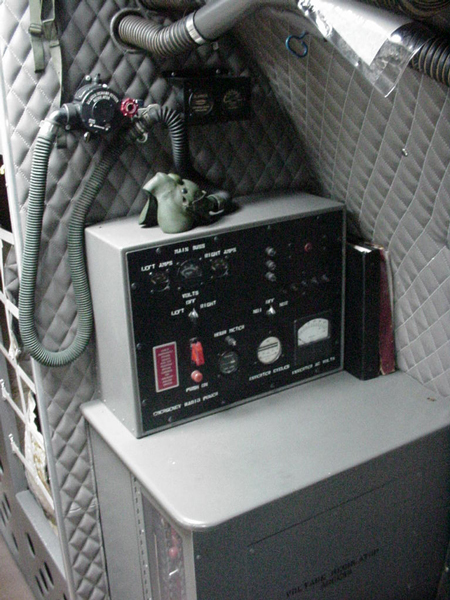 RADIO OPERATOR'S COMPARTMENT Immediately aft of the cockpit on the left side is the small Radio Operator's Compartment. STARBOARD BAGGAGE COMPARTMENT Looking over your shoulder from the pilot's seat, you see the baggage compartment across the aisle from the Radio Operator's Compartment. 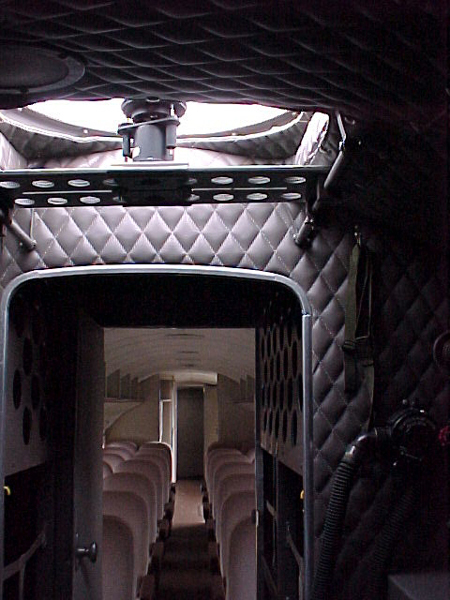 Beyond it is the door to the passenger cabin. 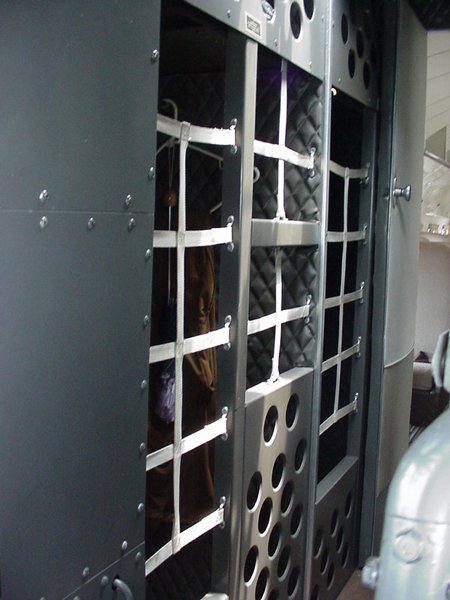 A similar, smaller compartment is situated aft of the radio compartment on the port side. ASTROD0ME Here you see the Astrodome (and you thought it was only a football stadium) with the Astro-Compass Mk II installed. This is a device that when pointed at a known star or the Sun will indicate true North. The primary purpose of the dome was celestial navigation. By using a sextant in the dome, along with a chronometer, and a set of tables, the navigator determined the aircraft's location. It's sliding mount allows the instrument to be moved in two axes within the dome, allowing it to be used and read by the navigator regardless of which way it is pointed.